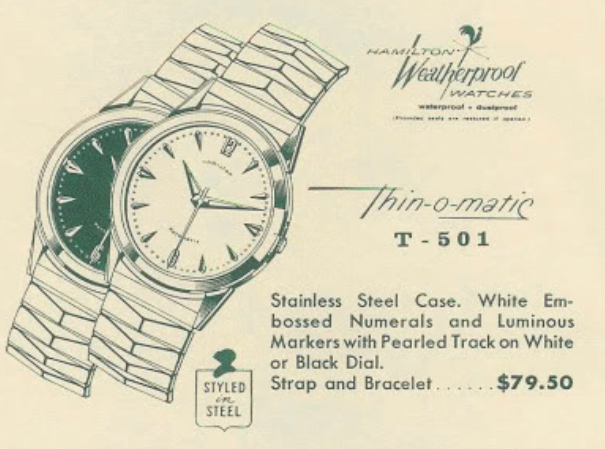 The first Thin-o-matic models were introduced in 1959 and one of the first models was the T-501. It was produced for three years. 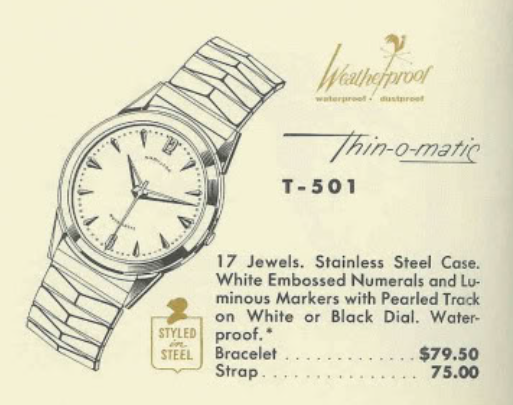 In 1960 a black-dialed version of the T-501 was introduced and the price for the watch was the same whether you chose the bracelet or the strapped version. As a 500 series model you can assume the T-501 has a stainless steel case. Tucked inside is a 17 jewel 663 movement, or possibly a 666 grade in a later model. I'm not entirely sure what's different between a 663 and 666 other than one is based on a Buren 1005 and the other on a 1005A. They seem to be largely interchangeable. I've had a T-501 sitting on my bench for a while - mostly because it's a micro rotor movement and particularly filthy. The outside looks like it should clean up nicely, after all, stainless steel can take a beating. The dial at the 4 hour marker looks a little odd - that's where one of the dial feet are. The case back has an obvious lip so it's clear that this back should pop off. You might be able to see that the crown isn't sitting flush with the case. As I said above, I knew this movement was filthy and this is about as bad as I've seen. Now you can really see the crown isn't sitting flush - that appears to have let a bit of moisture inside. One of the screws and clips to hold the movement inside the case is also missing and the other is a bit rusty. Fortunately I have some replacements. The inside of the case back has a couple of rings where apparently the oscillating weight has rubbed the cover. I'll make sure to set the weight a little deeper so it won't rub. There's also a modicum of solder or something inside by the lip - I'm not sure what that's about as I don't see any damage anywhere on the inside or out. The dial foot screw on the lower right (by the 4 hour marker) was corroded in place - that explains the funny look of the dial. A past watchmaker may have bent the dial a little trying to get it off. The dial-side of the main plate is as dirty as the rest of this movement. This should clean up well but sometimes corrosion will still leave a mark on the finish. While everything is in the ultrasonic I will get a new crystal ready for installation. A 29.3mm PHD crystal will do the trick. Everything is sparkly now that all of the parts have been cleaned. I noticed one of the pivots on the pallet fork arbor was missing so I had to replace it with a pallet fork from a donor. The reassembled movement is now running with good motion - so it's off to the timer. I'll put the oscillating weight on once the timing is checked out. It's running a little fast but a slight tweak to the regulator should slow it down. The amplitude looks good and the beat error is acceptable. The beat error is hard to adjust on this movement so I'll leave it as is and not risk damaging an otherwise good hairspring. A tweak here, a tweak there, and eventually the two lines approach horizontal. Everything looks good so I can finish reassembling all of the parts. Ta-da... this T-501 looks great now that it's cleaned up and has a fresh crystal and lizard strap. I was able to reshape the dial fairly well so the look of the 4 o'clock marker isn't obviously out of whack but it's still not perfect. Still, not a bad save for an otherwise worn out watch.